Home Anatomy and Body What Muscles Do Push-Ups Work? Have you ever done push-ups where your arms hardly bent and your hips hit the floor? Yes, we’ve all been there before, and it’s not helping your body. If anything, it causes more pain. Push-ups are total body movements that are great if you want to increase your strength and engage the core muscles of your body. Since the weight you’re lifting is your own body weight, you can do push-ups anywhere, with many variations, so you don’t get bored. Push-ups are very basic exercises, and once you know the form, you can do them easily. They will work on the muscles of your upper body. Just what muscles do push-ups work the most? Push-ups strengthen your upper body muscles and improve the strength of your core. The muscles that work during push-ups include the groups in the neck, back, triceps, shoulder, arms and chest. Since you’ll usually be doing your push-ups in the prone position, they will even help in developing good posture. Who Uses Push-Ups for Strength Training? Athletes and military personnel include push-ups in their routine of exercises that strengthen the shoulders and upper back, while offering torso stability. They also promote overall fitness and muscle endurance. Push-ups are called the ultimate in body-weight exercises, since there are different types you can do, dependent on your stamina and strength. You don’t need special equipment for push-ups, and they can be done wherever you prefer. What Individual and Group Muscles Do Push-ups Work? These are the muscles within your shoulder that help your pectoralis major to actually push the body when you do push-ups. 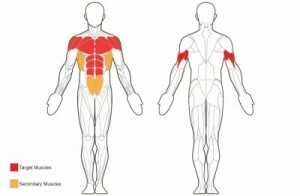 They are not the strongest group of muscles, but they are crucial to shoulder movement. Rounded shoulders are possible with well-defined deltoids. The “pecs” are two large muscles in the chest, which you use primarily when you push things. They make up the majority of the muscles in the upper body. When you raise and then lower your body doing push-ups, the pectoralis major does most of the heavy lifting. This muscle is in the back of your chest, under your armpit. These are the muscles that give your scapula their winged look. The serratus anterior muscles are activated when you do push-ups, and doing them regularly will help in making your muscle movements smoother. Your triceps are found in the back part of your upper arm. They help when you extend your arm outward. They make up roughly 2/3 of the mass of your upper arm, and they are the muscles you use the most in doing push-ups. This muscle runs from your upper arms to your shoulder blades. When you do push-ups, it pushes your upper arm against your body. This is essential when performing proper push-ups. You cannot build upper body strength without first developing your Coracobrachialis. Your abdominal muscles are utilized when you do push-ups, and this helps in developing your core strength. As you hold your body in its position, the muscles in your abdomen help your body to properly brace itself. These push-ups are commonly performed to target all the areas of your chest. The core muscles, triceps and deltoids activate when you do incline push-ups. There is less stress on your elbows, since it lowers the amount of body weight you are lifting. Incline push-ups prevent any sagging of your spinal column, since they cause the activation of your chest muscles. Doing the motions slowly, your core will engage, and your incline push-ups will serve you well as stretching before or after exercise. These classic push-ups are somewhat more difficult, as compared to standard push-ups. They don’t provide as much mechanical advantage for pushing your body up. Wide-grip push-ups target the triceps, chest muscles and the front shoulder muscles. The chest and shoulder are built up when they are assisted by your triceps in this type of push-up. These are simple variations on standard push-ups, the difference being that you will involve more muscle groups. These push-ups require your muscles to work harder in order to balance your body during your exercise. They work the shoulders, core muscles and chest. These push-ups strengthen the triceps and chest muscles, while building a muscular, stronger core. Your obliques and abdominal muscles work hard, in keeping your body stabilized on just one arm. You need to possess enough strength to maintain your position. Building strength and muscle is vital for the control of the total body you need when doing one arm push-ups. These are advanced upper body push-ups that target your back, arms, shoulders and chest. Since your feet are higher than your hands, you increase the difficulty in maintaining the proper body position. It requires stability and strength in the back, core and legs. How do you do Push-ups? Push-ups are simple exercises to build the body. They strengthen your core and upper body. What muscles do push-ups work? They use muscles in your legs and back, and also your triceps, shoulders and chest muscles. Lower your body to the floor. Keep the palms under the shoulders, at a position that is a bit wider than the width of your shoulders. Your feet should be close together, with toes pointed to the floor. This stabilizes your lower body. Keep your body flat by using your abdominal muscles. Focus your eyes a few feet in front of you and lower your body slowly, maintaining a flat back until your chest nearly touches the floor. This position, flat like a plank, is the position in which you start and end each push-up. Keep your elbows close to your body. Draw your shoulder blades down and back. Maintain a face-forward position and inhale slowly as you are lowering your body. Exhale and push back to your starting position. Your shoulders and chest muscles provide the strength you need for push-ups. Continue to push in an upward direction until your arms are nearly straight. Keep your arms wide. This makes it easier for you to do push-ups properly. Do your push-ups properly and slowly. Don’t try to rush them. In the beginning, you may need to balance on the knees instead of the toes. Try to keep your hips elevated. If your lower back hurts, take a break from push-ups. Repeat these steps after you pause for several seconds. Make sure you stretch before exercise and cool down when you have finished.